Happy new year to you! Hard to believe it’s 2015 already, but it is. I hope you had a great holiday break and feel refreshed and ready to start the year off right. 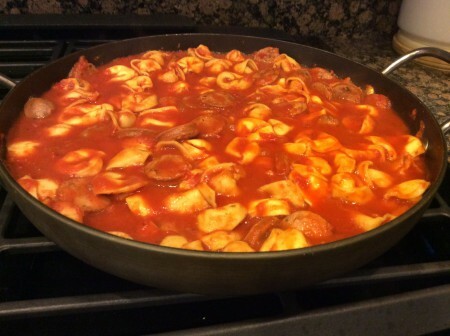 To get us going, I wanted to share a new healthy comfort food recipe that you can make in one pot and have leftovers to last you the week: my sausage and tortellini skillet.How do I make this traditional dish healthy? A few easy substitutes: chicken sausage instead of regular Italian sausage, whole wheat tortellini instead of white flour tortellini, making your own red sauce without all the preservatives and added ingredients with plain crushed tomatoes and you’ve got one heck of a healthy, tasty pasta dish. I’m sure after the parties, cooking and general crazy times of the holidays, you’re looking for something that’s quick, easy and filling and this recipe fits the bill. It’s all made in one pot (or skillet as the case my be), it’s done in about half and hour and it is good. One of the best parts about this sausage and tortellini skillet is the fact that you can make it ahead and reheat it later, and it holds up really well. The first time I made it, my boyfriend’s brother and sister-in-law were in town over the weekend for a friend’s wedding. When they got home, they were starving and I’d just made a batch of the tortellini earlier that day – George got a bowl out of the cupboard, scooped some into it, threw it in the microwave and they both tucked in and finished the whole bowl without a word – I didn’t even have a chance to put the parmesan on top, but it didn’t seem to matter. If that’s not an indication of a good recipe, I don’t know what is. Sometimes silence is golden. Slice sausage into 1/4-inch-thick slices. Cook sausage in a large skillet over medium heat for 5 minutes, until browned. Add tortellini, tomatoes, broth, seasoning, garlic powder and pepper to skillet. Bring the whole thing to a boil. Cover (to prevent splattering), reduce heat and simmer 10 – 12 minutes until tortellini is done. Divide into 6 serving bowls and sprinkle with parmesan cheese. This is delicious and it reheats like a dream too. 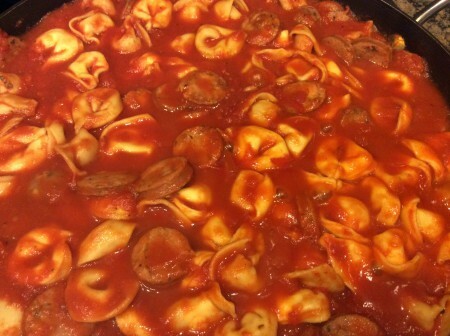 This entry was posted in Entrees, Recipes and tagged Comfort Food, Entrees, One Pot Meal, Pasta, Recipes, Red Sauce, Sausage, Sausage and Tortellini, Sausage Pasta, Sausage Tortellini Skillet, Tortellini on January 4, 2015 by Paige N..